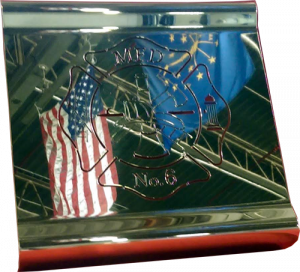 Cut from our stainless steel bumpers, an industry trademark, in use on fire trucks in all 50 states. 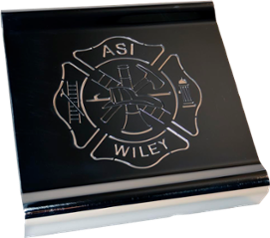 Plaques are engraved with your choice of names, dates, and graphics. Have a special request? Send us ideas and we’ll contact you to discuss the details. A token of gratitude, a statement of remembrance, or a display of pride; these plaques commemorate fire fighting personnel. Avionic Structures of Indiana has been manufacturing fire truck bumpers since 2010, a product in-use on countless fire trucks nationwide. ASI thanks fire fighting personnel for their service and bravery in the line of duty. For more information, contact us at (765)671-7865 or email Ben Wiley.